Before large cars with drivers ferried them around, many politicians lived in inner suburbs to be near public transport. This was particularly so when the Commonwealth Parliament met in Melbourne, as it did until 1927. Albert Park was one such suburb. The old ‘dogbox’ or ‘red rattler’ Melbourne trains, pulled by steam engines at first then electric after 1919, trundled from Flinders Street to St Kilda, via South Melbourne, Albert Park and Middle Park. Both Andrew Fisher, three times prime minister between 1908 and 1915, and King O’Malley, senior minister, lived in Albert Park. One can imagine Fisher, rampant moustache, greying hair and broad-brimmed hat, striding down Bourke Street from Parliament House, perhaps with Billy Hughes snapping at his heels, then round the corner to Swanston Street and down to the station to catch the train. For a time he had rented in Park Street, St Kilda but, in 1907 as his family grew, he bought a block of land at 50 Dinsdale Street, Albert Park, and borrowed to build a double-fronted, three bedroom brick home. Fisher was living in the house when he became prime minister for the first time on 13 November 1908. It is said that Fisher sometimes eschewed the train and walked the six kilometres home from Parliament House; perhaps his Albert Park neighbours wished him well as he walked home on this late spring evening. The residents of Dinsdale Street seem to have been on the cusp of middle-class gentility and workaday pragmatism. They lived in a wide street, close to the beach and Albert Park Lake but among a mix of cottages and more substantial dwellings and within whiff of the gasworks. The South Melbourne Football Ground (in 2014 long since converted to soccer) lay next to the Lake. The Dinsdale Street house looks desperately small on Google Street View today and so it proved. Living there were Fisher, his wife Margaret, their four (soon six) children, Margaret’s mother and Margaret’s three sisters. There was a continuous flow of guests and Fisher often escaped from the bustle by staying in bed to work. By early 1912, the crush at Dinsdale Street had become so extreme that Fisher, now prime minister for the second time, moved his family to a larger house he had bought a few kilometres away in Hughenden Road, East St Kilda. After Dinsdale Street was rented for a time Fisher’s daughter, Margaret (Peggy), lived there for many years until her death in 1988. 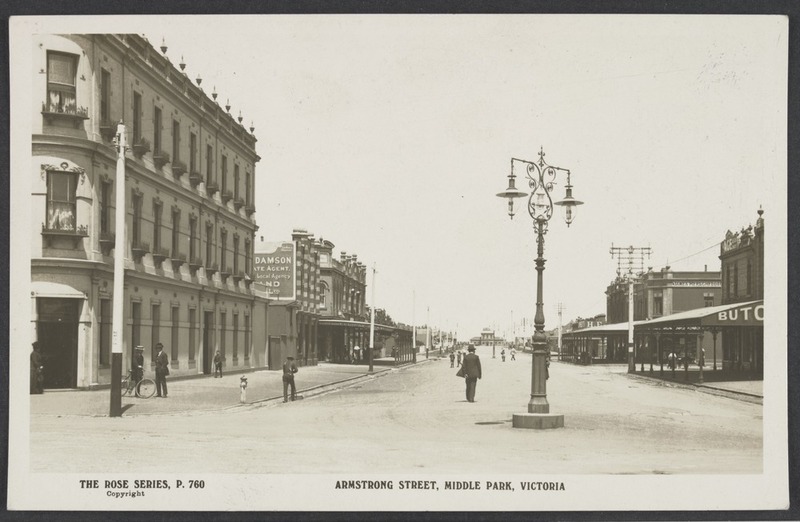 So Fisher’s direct link with Albert Park lasted less than five years, but one wonders whether he retained a special connection with the small house in Dinsdale Street, perhaps not much larger than his boyhood home in Ayrshire or his house at Gympie, and certainly as crowded. Perhaps he remembered Albert Park, through the fog of dementia, in his declining days (depicted in David Day’s biography) in London in the 1920s. King O’Malley and Albert Park had a far longer affiliation, though he and Fisher overlapped in the suburb for a couple of years. 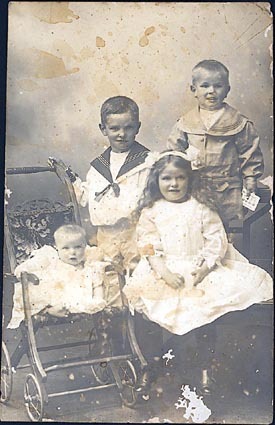 O’Malley, known by his intimates as ‘The Bish’ – short for Bishop of the Waterlily Rockbound Church, the Redskin Temple of the Cayuse Nation, which was not meant to be taken seriously – moved into a house at 58 Bridport Street in 1910 and lived there until his death at 99 in 1953. Bridport Street was and is also a wide street, with shops further west but quieter and residential at the Lake end where O’Malley lived. O’Malley and Fisher seem to have had a high regard for each other – though this is not beyond dispute in relation to the share of kudos for the establishment of the Commonwealth Bank – and perhaps they strolled companionably together along the sand at Middle Park beach or around the Lake. Certainly their residences were only a few minutes apart. They would not have talked Australian Rules football since O’Malley believed that sport promoted excessive consumption of ‘stagger juice’ (alcohol) and Fisher, from Scotland via Queensland, was presumably loyal to a different game. Like Fisher’s Dinsdale Street, O’Malley’s Bridport Street was a hive of activity. In his biography of O’Malley, Larry Noye quotes Janet Cooper, an expatriate American (like O’Malley), local doctor and later Mayor of South Melbourne. We spent wonderful evenings at King’s place. He would hold the floor – he always held the floor – but he was so entertaining we just sat back and let him talk. He was a real showman and we loved it. You went up there because you loved to; more than one could ever imagine. I will never forget one time when Leslie Jauncey, a very fine man who wrote Australia’s Government Bank, was there … King referred to “that ecclesiastical rooster”, Dr Mannix, the Archbishop of Melbourne. He said that his church had its “Mary McDillon”, his way of saying Mary Magdalene. It was all so funny that Dr Jauncey fell off his seat and rolled on the floor with laughter. O’Malley’s day diaries reveal this could have been on 13 December 1932, when ‘Dr. Cooper, Jauncey, Arnold Wilson’ all visited, or 29 January 1933, when the page showed ‘Dr. Jauncey, Dr. Cooper, Margaret [for] Tea’. The diaries show Jauncey visited Bridport Street 47 times between 25 August 1932 and 29 January 1933. On 25 January, ‘Mr. Williams’ took the famous photograph of Jauncey, King O’Malley, his wife, Aimee, and Dr William Maloney MP in the O’Malleys’ parlour, known as ‘the torpedo room’ and claimed by O’Malley to be where the plans for the Commonwealth Bank were laid. Peggy Fisher, on behalf of her late father, might have claimed that the Bank was born in Fisher’s high-ceilinged bedroom in Dinsdale Street. Labor politicians continued to live in Albert and Middle Park through the twentieth century, Frank Crean (who knew O’Malley and was his local member 1945-47), then his son Simon. (One of the authors once interviewed Frank in the Crean kitchen.) The red rattlers have long since gone, as indeed have the trains. Any politicians living in Albert Park nowadays get there by light rail or, perhaps, by chauffeur-driven car. Port Phillip Bay is probably cleaner now than it was then and the gasworks have been turned into an arts precinct. You can buy railway antiques, restored furniture, coffee and cakes at the old Albert Park railway station. Sources: Peter Bastian on Fisher, David Day on Fisher, Larry Noye on O’Malley, Wikipedia on trains and Albert Park, Google Street View.